Does NFL Technology Favor The No Huddle Spread Option Offense? I was wondering the other day if the NFL with its micro-phoned helmets that allow a coach to communicate with the Quarterback in real-time makes the no huddle spread option offense more conducive then college and high school? Just to clear up one thing, this microphone communication in the NFL shuts off automatically with 15 seconds left on the 40/25 second play clock, but that still gives the coaches up in the booth time to relay an initial defensive look downstairs that can be sent in to the dual threat QB on the field. We've all seen it during college and high school games, the QB in a no huddle shot gun spread offense checking with the sideline between one to three times prior to the snap, then audibling the best possible play to the rest of the offense based on the information from the coaches box. At these levels, the coaches and spotters (usually the back up quarterback's) need to hand signal the audibles to the QB on the field. I believe I once read an article where Rich Rodriguez was asking the NCAA to look into microphoned helmets at the college football level. 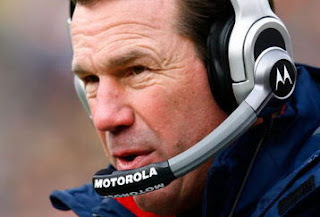 One point to bring up, beginning last NFL season (2008), the defense also uses the same microphone technology, designating one player (usually the "Mike" linebacker or strong safety) to get the play call(s) from the sideline. It'll be interesting to see if this advancement in real-time coach to player communication at the NFL level assists at all as the spread option offense makes its way into the NFL. I recently took a look at the 2009 major college football schedule and if you're a fan of the spread offense, get ready for a buffet type feast of action. Below I decided to list some must see early season games (with TV coverage, if available) showcasing shot gun spread offenses going against one another. I'll get another listing out as the season progresses, but get those DVR's warmed up and set your email calenders with the above for now.